It is an interesting theoretical question whether to distinguish this generic version – Apocalypse or the end-of-the-world story, Mary Shelley’s The Last Man and the post-nuclear landscapes – from the densely inhabited dystopias of various kinds of which these books have also given us a sample. My current feeling is that the post-catastrophe situation in reality constitutes the preparation for the emergence of Utopia itself, which, to be sure, in Atwood’s new instalment we reach only by anticipation (of which I will speak in a moment). Who will recount the pleasures of dystopia? The pity and fear of tragedy – pity for the other, fear for myself – does not seem very appropriate to a form which is collective, and in which spectator and tragic protagonist are in some sense one and the same. For the most part, dystopia has been a vehicle for political statements of some kind: sermons against overpopulation, big corporations, totalitarianism, consumerism, patriarchy, not to speak of money itself. Not coincidentally, it has also been the one science-fictional sub-genre in which more purely ‘literary’ writers have felt free to indulge: Huxley, Orwell, even the Margaret Atwood of The Handmaid’s Tale. 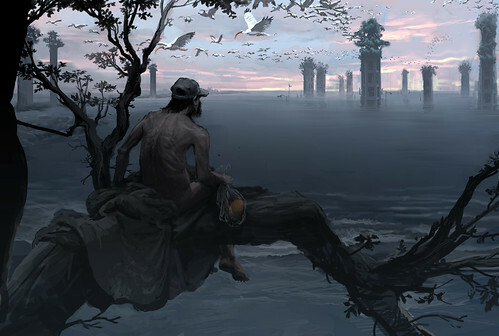 The ideological antithesis to the Golden Fang is the lost continent of Lemuria, submerged beneath the Pacific Ocean, which the hippies and surfers imagine as an anarchist utopia, more or less accessible depending on how much acid you happen to have taken. Utopias are what the paranoid imagine when they’re on a good trip. The trouble is, it’s not always straightforward to disentangle the positive paranoia from the negative, and impossible to know which side everyone – including yourself – is really on. The more closely you scrutinise the struggle between anarchist utopia and totalitarian capitalism – also one of the threads in Against the Day (2006) – the more interdependent they seem to be. The issue also includes Michael Wood rather fruitlessly butting his head against Inglourious Basterds. Still, it is nice to see fiction getting a look in. Via MetaFilter, where, as usual, conversation turns to the question of whether Atwood is a tourist.